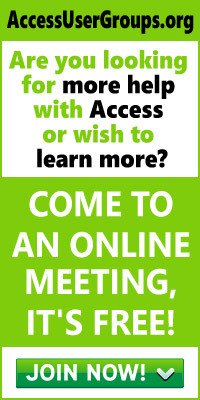 By using the WithEvents keyword, you can extend the possibilities of Access’s classes. Marek presents new ideas on programming in Access. Communication between Access applications and other applications that support OLE Automation (Excel, Word, PowerPoint, Outlook, and so on). See the sidebar “Excel-ent Events” for an example of the kinds of events that you can intercept in this scenario. As you can see, there are just four lines of code in the Form_Load event. These lines first create a copy of the cTextBox object for each text box on the form. The lines then tie each text box to one of those cTextBox objects. I then save the form, open it in the Form View, and try to tab out of either of the text boxes. When I do, the message “You are in the Exit event of the cTextBox class” appears. What does this mean? It means that, with the WithEvents keyword, it’s possible to create Class modules that contain standard code for working with form controls and reuse them in different Access projects. You can even place these Class modules in a library database so that the code can be reused without having to cut and paste the Class modules from project to project. With this code, I’ve created a property called Length for my object. The Length property is used to set the value of the intLength variable. I also have a KeyPress event that fires every time the user presses a key in the text box. The code in the KeyPress text box checks the length of the Text property in the form and sees whether it exceeds the length specified in the intLength variable. If it does, the event sounds a beep and exits the routine after setting the KeyAscii parameter to 0. Setting the KeyAscii parameter to 0 causes the last keypress to be discarded. This object has a BindForm method that accepts a Form object variable. The cFormListener object’s frm variable is then set to the Form that’s passed to this method. As a result, the frm_Activate and frm_Resize routines will now execute when the Form passed to the BindForm method fires its Activate or Resize events. This time I used the Form_Open event to create a cFormListener object and then bind the Form to the object using my BindForm method. Now when I try to resize the form, I’ll get the message boxes that show that the cFormListener is responding to my form. I could use this technique to create a reusable Class that would be able to resize any form. To tie the object to the form, I’d need only two lines of code (one of which is the declaration of a variable). In this form, clicking on the Command button causes the option group to change, and selecting one of the options in the group changes the Command button. The code that does this is in the cTwoControls object, outside the form’s module. 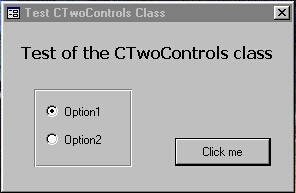 The code in the cTwoControls object can be found in Listing 1. The code creates BindCommandButton and a BindOptionGroup property that accept a reference to a Command button and an Option group. The two event routines in the listing are fired when either the Command button is clicked or the Option group is updated. In the Command button code, the Mod operator causes the option group to toggle between its two settings. In the Option button code, the caption on the Command button is swapped between bold and normal. Listing 1. The code for the cTwoObjects object. The ValidateControls routine checks to make sure that the references to the Command and Option buttons have been set. If the relevant object variables aren’t set, ValidateControls exits with an error code. The WithEvents keyword gives you power that you never had before. You can move basic functionality from forms into classes and share those classes among Access projects. It’s also possible to mix the functionality of two different classes, creating a kind of simple inheritance. As a bonus, the sample database that comes with this article is set up so that all the classes in it are available to other Access databases (it’s available in the accompanying Download file). If you add a reference in your Access database to my sample database, you’ll be able to use all the classes defined in it, just as if they were defined directly in your project. The simple trick to expose classes from library databases to other Access projects is described on the ATTAC Consulting Group Web server at http://ourworld.compuserve.com/homepages/attac-cg/acgsoft.htm. Marek Kepinski works as a technical consultant at Impaq Technology Center, a Microsoft Solution Provider based in Warsaw, Poland. He’s currently working on a major database project for a Swiss bank. MKepinski@Impaq.com.pl. Class modules in Access allow you to define objects by writing VBA code. In a Class module, subroutines and functions appear as methods of the object defined by the Class module. Property Lets, Gets, and Sets allow you to create properties for your objects. The techniques presented in this article can be used not only in Access, but in all the other Microsoft applications that support Visual Basic for Applications. The version of VBA that’s used by Access 97 contains some new Visual Basic keywords, which can’t be used as identifiers (these include AddressOf, Assert, Decimal, DefDec, Enum, Event, Friend, Implements, RaiseEvent, and WithEvents). If you try to use these keywords in your code, you’ll get a compile error — that is, except for the WithEvents keyword, which can be used in Access 97.